I take a lot of screenshots on my mac. Sometimes it’s simply the quickest way to save information from a web page or design I’m working on, sometimes it’s because I need to show someone what they should be seeing on their screen when I’m helping them with their computer by email. Doing so many and not always wanting to delete them immediately was making my desktop a bit of a mess, so I googled for a way of changing where they’re saved. OS X Daily had exactly the answer I was looking for. Update from the comments: Some have said this only takes effect when they restart their computer. I wanted to make the folder look a bit different, so quickly created an icon for myself. It’s actually the “icon-camera-retro” from Font Awesome with a white gradient background inside the camera and transparent background. Sure, it won’t win any awards but if you want it, help yourself. Click on the image and you’ll get the standard wordpress image page with a download option (or right-click, save-as as you prefer). If that doesn’t work, do you get any error messages? Note: Capitalisation of ScreenShots needs to be the same in both steps (eg: Screenshots in step 1 will not work with ScreenShots in step 2. Nice, worked for me, thanks. Just use Onyx. No restart required and you can define the naming convention of screenshots. going to a more basic level for ultra thickness like me, what is terminal? I don’t understand where to write whatever in…can you help please? Here’s a page that talks about the program ‘Terminal’ that will help you find it. Short version: Terminal is a program that that gives you a ‘command line interface’, basically a place you can type commands and instructions to control the computer. Thanks for the tip but how do you change the symbol for the folder? Thanks very much for the how-to. Weird thing is that the protocol also seems to support drag’n’drop, except it doesn’t and I couldn’t get it to work for local image files (in both cases you get the icon of the Preview application). 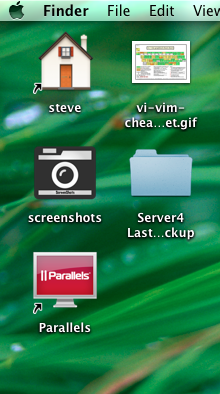 Unfortunately the icon doesn’t change if the folder is in the sidebar. OK, I tried this and now I can’t find my screenshots. They were going to my desktop and I tried to change them to go to my Downloads folder. They aren’t there so I did something wrong. Was I supped to hit Enter between the two commands? I did and I am thinking that is where I went wrong. Too scared to try again without guidance first. Thanks! then you can repeat it with the correct location. The command replaces the last setting so repeating it does no harm. In case it didn’t appear to work, you could try restarting the computer first just to make sure. MY TERMINAL WINDOW WILL NOT SAVE ANY COMMANDS I PUT IN IT. BUT WHEN I CLOSE IT AND OPEN IT AGAIN, THE COMMAND IS GONE! ANY HELP YOU CAN PROVIDE WOULD BE GREAT, THANK YOU. That is correct, put the command in, press return. A new blank line will appear below your command and you can close the Terminal window. Put in the next command (killall SystemUIServer) and press return again, or restart your computer for the same effect. Screenshots should now go into your screenshot folder. Terminal is *not* like a Microsoft Word document and it is *not* like a configuration file so you won’t see all the things typed before when you open it again. Try again and post back how you get on. It irked for me when it didn’t work, but then worked for me only when i restarted my computer! i learn’t something new today. I am a basic user of computer & had no formal training!Thanks a lot!!! Thanks for commenting Naren, I’ve edited the post to add a note about restarting the computer. Made my day! For whatever reason, screenshots would almost instantly be deleted from my desktop so I’d never be able to access them, and I’d been using a 3rd-party screen capture tool. I prefer using a dedicated folder, anyway. Thanks for being so responsive, Steve. I have one more for you though. I put in the first command “defaults write com.apple.screencapture location / Users/JUSTIN/Pictures/Screen Shots/ “, press enter, and it says “unexpected argument Shots; leaving defaults unchanged” What am I doing wrong? Quick answer: you’ve got a space in your path. Thanks. I had no problem setting up the ~/Pictures/Screenshots folder and everything worked fine yesterday. But for some reason today, when I take a screenshot it’s not appearing in the folder. It’s there, because when I search for it, it finds it and shows the path to the folder. When I return to the folder, the files have appeared. Any thoughts? I’ve had similar experiences over the last year. My current best guess is that ‘Finder’ (sometimes) isn’t refreshing the view of files as soon as the image file is created. However OS X knows it’s there because (as you’ve seen) you can find it by searching and I’ve been able to get the image to use in other programs (eg: attach to email). I’ve also found that when the view is set to “Arrange by date added” (so my latest screenshot is at the top of the folder) the image sometimes appears at the bottom in a section labelled “no date”. Later on it will appear in the correct “today” section. I’ve not been able to consistently recreate the problem though so it’s continued to be a minor annoyance. If you work it out (or anyone reading this does), I’d love to know a solution! How do I erase my screenshots from my large folder called just plain photos? Delete them the same as you would delete any file, drag the file(s) to the trash bin. Maybe I should loop the pics around themselves, sling ’em around my shoulder and tie up my stuff with a scarf, tie them to a stick, and hoof myself gone? Piece of cake! You rock kid. Didn’t event need to restart my computer! YAY!! it works great! AWESOME! thanks! I have followed the instruction you listed (very helpful btw) but the screenshots are saving to the dedicated folder and my desktop. Same file, two locations. Anyway to just make it save to the Screenshots folder? Thanks! c) Follow instructions above but this time use different folder. eg: instead of ‘defaults write com.apple.screencapture location ~/Desktop/ScreenShots/’ try ‘defaults write com.apple.screencapture location ~/Desktop/anothershot/’. Test. Reboot. Test. If it hasn’t worked by that point them I’m struggling to think what it could be. I’m not sure if it makes a difference if the destination folder exists before you type the command into terminal, but if you’re at this point there’s no harm in trying. Either way, do post back if it works or not in case someone else has the same problem and you’ve found the solution. I rebooted twice. Made sure my OS was up to date. Then I started with a fresh folder and followed your instructions, problem solved. Thanks!